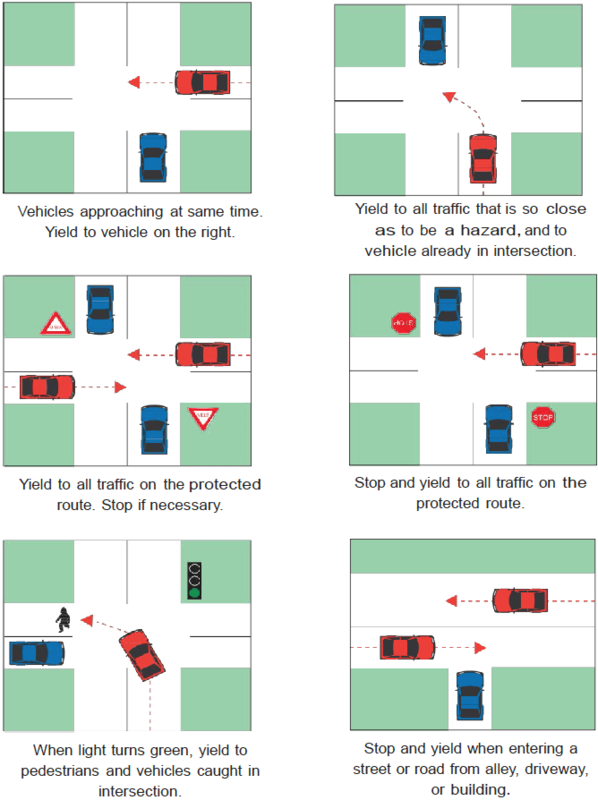 Two basic laws govern the approach to and movement through uncontrolled intersections. reasonable and proper rate when approaching and traversing an intersection. When you are driving on a street or highway which is not protected with stop signs, yield signs or traffic lights, you are driving on an unprotected route and the intersections are uncontrolled. At such times you are required to slow down and have your vehicle under control at a cross street or a cross road. Approaching from the right does not excuse you from slowing down and having your vehicle under control. When two vehicles approach an uncontrolled intersection in such position and time that there is danger of collision, the driver of the vehicle on the left must yield to the driver of the vehicle on the right. If you are the driver approaching from the right do not assume that you have the right of way. You have the right of way only when the other driver gives it to you, and only if another vehicle is not already within the `intersection. Roundabouts, sometimes called traffic circles, are circular intersections designed to promote safe and efficient traffic flow without necessarily stopping the flow of traffic. In a roundabout vehicles travel counterclockwise around a raised center island where approaching traffic must yield to traffic in the circle. Slow down as you approach the circle. Roundabouts are designed for speeds of about 15-20mph. Always enter to the right of the center island. Enter when there is a gap in traffic. Once inside, do not stop. Follow directions on signs or pavement markings about which lane to use. If there is more than one lane going in the same direction, make sure you know where you want to go and are in the proper lane before entering. Yield to any traffic already in the circle. If another vehicle arrives at the same time, yield to the vehicle if it is on your right. Yield to all pedestrians and bicyclists in the roundabout. You may exit at any street or continue around if you miss your exit.